A few years ago, a fundamental shift occurred in the way marketers began to view online content. Initially, there was a bit of a “build it and they will come” mentality, where marketers felt that they could just create content, put it on their website, and it would organically generate the reach and engagement they were looking for. However, in 2014 we’ve come to realize that a content distribution plan is essential to achieving desired results from our content marketing efforts. Consider the many compelling reasons why you publish content in the first place. For starters, there’s the potential for the links in your content to provide equity for your site on search engine results pages (SERPs). There’s also the additional brand awareness that can come from putting your content in front of new audiences (i.e., prospects who may not already know who you are or what you do). Not to mention other business goals that quality content marketing can help you reach, like engaging fans on social media, increasing click-through rates, addressing the needs of your customers and prospects, increasing the influence of your company’s thought leaders, and so on. None of this happens haphazardly — at least, not in a way that you can likely sustain over the long term. So the more thought you put into where, when, and how you distribute your content, the greater the chance that it will pay off in terms of business success. In this post, I’ll discuss where some great opportunities lie to optimize your content distribution strategy from the three main media perspectives — owned, earned, and paid — and offer suggestions to help you to grab attention from the consumers who are the most relevant to your business. The first place to start is with your company’s owned media channels — places like your blog, your website, an email newsletter, or a corporate magazine. These channels also include your “branded” properties, such as your Twitter account, Facebook Page, LinkedIn company page, Google+ page, and other social profiles. Most marketers’ initial impulse is to blast their content out to as many people as possible, so they rush to publish each piece of content they create on every channel available. While it’s natural to want to share that great piece of content across multiple consumer touch points, it’s best to do some testing and research first, to see where the greatest potential for successful distribution may lie. 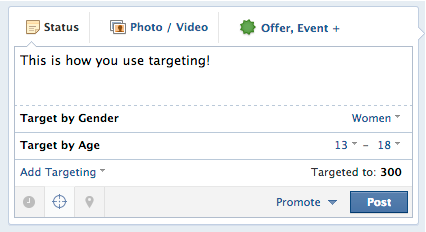 For example, you can split test your Facebook content (something I’ve written about previously) to get a clearer idea of how factors like content length, image, time of posting, call-to-action message, and targeting criteria might impact a post’s success. By showing different variants to different user groups you can quickly determine what types of content your audience is finding most engaging. The process to do this is simple: When you schedule a Facebook post, you can choose who sees it in their News Feeds (in most cases, you need to have at least 1,000 fans to have access to the targeting dashboard, though). For example, we might segment the audience for a particular post by gender and by age brackets, showing one version of content to women 13-18 years old and another to women 19-30 years old. This gives us a fair way to test two versions of content on the same social platform, and if you do this with your posts for a period of time, some interesting data can emerge about your followers’ interests and engagement preferences. What you learn about which content fans engaged with more strongly can then be applied to more fixed content, like posts on your company blog or articles in your eNewsletter. Ensure that your tests are planned out and fair. For example, if your audience has a very small segment of users in one particular age band, that group will naturally underperform in your results. Make sure that you balance everything out with averages and that you have enough data to make your tests statistically relevant. Where you don’t have enough data, consider using paid distribution to boost your reach to get the level of data you need. Ideally, for getting a fair comparison of performance, you want a minimum of 500-1,000 people per group tested against. 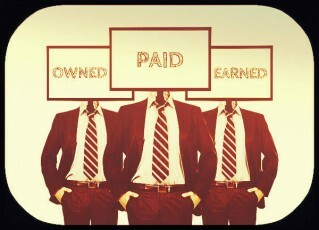 Earned distribution (e.g., coverage in mainstream media; guest posts on others’ blogs, etc.) is probably the hardest to achieve — and the hardest to optimize — since it’s dependent on others’ interests, guidelines, and business agendas. Yet, it remains a highly powerful means of distribution, given its potential to exponentially increase your reach and engagement without having to significantly increase your output. The key to earned media success is, of course, to create epic content that attracts the attention and interest of external outlets. But unless you are very lucky (or work for a major, household-name brand), chances are those outlets will not find your content without some effort on your part. So you will need to start by reaching out and engaging with relevant outlets and influencers in your industry. Content outreach in this way has large crossovers with the PR world. But while PR is hard to optimize, there are plenty of ways to improve how you find the right prospects and engage them through content. For example, my team creates prospect lists, ranked by various key metrics, including social audience, trust, citation flows (we gather this data using Majestic), and the author’s/publication’s perceived influence amongst a relevant audience. You can find this data by running Google searches or by using tools like Followerwonk. From these initial lists, we look at the metrics of each site — as well as their proportionality to each other. For instance, say we find a news website that has great site metrics — for example, a PageRank 5 (PR5) site (PageRank is a Google metric for measuring website equity) with thousands of seemingly good links, citations, and a trust flow from Majestic of over 40, but only a small social audience and hardly any social shares of its content. That site would probably be excluded from our list on the basis that the social and on-site metrics are not proportionate to each other. On the other hand, if we found a PR2 site with a social following of 2,000 and at least 60 shares of each of its posts, the proportionality of these metrics indicates that it has an engaged audience and, thus, is likely to be a good outlet to keep on our list. By grouping and applying metrics in this way, we are able to quickly ascertain which publications and/or blogs were worth targeting first, thus streamlining our outreach efforts. Conduct research to learn more about the influencer you are targeting and identify topics to mention in your outreach to engage his or her interest. Consider creating lists of influencers that you want to engage with in Tweetdeck, so that you can keep track of what they are interested in during the time you are going to be initially engaging them. Find your influencers in Followerwonk based on their profile descriptions, locations, and social authority score, then simply create a list in Tweetdeck that you can keep an eye on, ready for when an opportunity for you to engage with them in a relevant way arises. Paid distribution channels hold the best potential for optimization. Whether you’re running paid search ads in AdWords, placing sponsored content or ads on Facebook, or are distributing content as part of a native advertising strategy, there are ways to optimize virtually every element of your distribution in detail — and with complete control. Being able to split your content out in this way and showcase it to different audiences allows you to see which groups prefer your content, or which version of your content works best based on metrics such as click-through rate, engagements, and conversions. Measuring this means that you can take what you learn and apply it to your overall content strategy, as well as to your distribution strategy. For instance, if your distribution tests through Facebook advertising show that your content works best for audiences between the ages of 25-30 who are college graduates, this can steer you toward the right target when creating future content, as well as identify potential new outlets for your content, such as on alumni sites. Want to bring some new energy to your content marketing program? Check out Building the Perfect Content Marketing Mix to see which tactics content marketers are adding to their mix this year. Ben Harper is one of the co-founders of Datify, a data-driven marketing company based in the UK. Datify specialises in insight-led strategies focused on driving ROI for a range of clients across the social, search & content marketing arenas.